We all have places that mean something special. Maybe it’s the state where you grew up, or where you met someone significant, or a treasured vacation spot. Today’s Grommet does triple duty as a handcrafted work of art, a functional cutting board, and a personal reminder of somewhere you love. The creators, Bill Mowart and Amy Stringer-Mowart, made their first U.S. state-shaped cutting boards for their own wedding reception. They carved them in the shape of Michigan, where she grew up, and Connecticut, his home state. Family and friends loved them, and today the design duo is busy making cutting boards for all 50 U.S. states and 4 countries. Bill and Amy run an interior design fabrication business, so they have the tools and the know-how to work with Plyboo, which is a butcher-block architectural plywood made from bamboo. You can see the layers of sustainably harvested bamboo in the ¾-inch thick material, which gets cut, sanded and finished by hand in Bill and Amy’s Brooklyn, N.Y. studio. 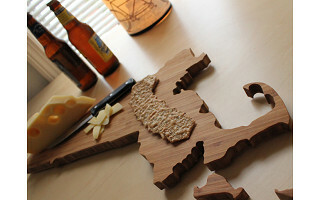 Each cutting board is custom made to order, the perfect gift for yourself, a hostess, new homeowner, or bride and groom. Hello from Brooklyn NY! 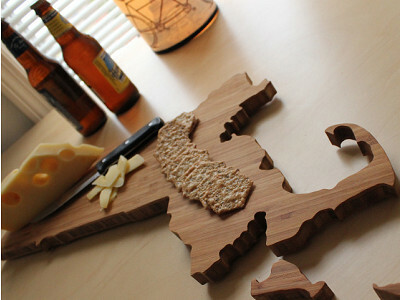 We are excited that Daily Grommet has chosen to share our state shaped cutting boards with you today. Each of the state cutting boards are manufactured in the USA and provide a decorative and useful display for entertaining with your state pride in mind. I am here to answer any questions you have. I love this idea! Would you ever consider doing countries? I'd love to buy a board of Italy! Thanks so much for asking Beth! I am happy to report that we will be adding Italy shortly for purchase, keep a look out for four countries to be added Italy, France, Germany and Australia! @Amy Stringer-Mowat Great! I see on your Etsy, you have a custom request for anywhere in the world. Would I purchase it there? Or will you be back on the Daily Grommet with them? Made in the USA! Woohoo! Sold! @Donna Thanks Donna! We are very excited to be able to manufacture in the USA and to stay as local as possible. I don't understand how the Hawaii and Michigan ones work. Are they separate pieces? @Mary Yes! you have that correct, we are trying to be as geographically correct as possible so it they are separate. In terms of Hawaii, the big island is a usable size, with the smaller islands as display. Thanks! Why wouldn't you include the District of Columbia? I know it's not a state but it is our nations cap. @Rhea Fairley: Great idea & question. I have forwarded it on to Amy and will let you know. @Rhea - Thanks so much for asking! we have done DC and it turned out nicely, at the moment we are only offering the 50 states and a few countries for our product line. Could you do just the island of England? Or do you feel bound to add in the various islands too? Either way, I'll buy that, and maybe Nebraska and California too! @Lisa we have done the UK in the past and it is a nice shape, but we are currently only offering the 50 states and a few countries with Daily Grommet! stay in touch as we might be able to offer the UK at a later date. Hi! My friend has the MA board and hers has a heart carved where her town is on the state. Do you offer that possibility?? Great idea- I love these! @ Jen: Glad you love this unique cutting board. At this time, the heart carving is not being offered through Daily Grommet. Thanks for your interest. Could you please give me the appoximate measurements for the Ohio cutting board? thanks...these are very cool! *The length and width vary with the edges of the borderlines. You can read more info in the DETAILS tab of the page where the Grommet is featured. My family and I were in Hawaii in March and the place we stayed had wooden cut outs of Hawaii on their wall - each island a separate piece. My parents really liked them but we couldn't find them anywhere to purchase. Can you tell me about the Hawaii board as it looks like what my parents would like - probably to put on the wall instead of using for a cutting board? Is it in many pieces? Or could you create what we are looking for? How do you pronounce "AHeirloom?" it should be "an heirloom." or "AnHeirloom." Nice, but.....SERIOUSLY?? COLORADO and WYOMING? Could you not have added something to them to make them more than I could by at my neighborhood Ace Hardware? How about a board of the good ole' USA? the Upper Peninsula of Michigan only. Say 24" in length? Might be a good idea to provide personalization with something permanent like wood burning. These are a great gift to take to a new home engraved with their name or a unique saying, etc. We all have places that mean something special. Maybe it’s the state where you grew up, or where you met someone significant, or a treasured vacation spot. Today’s Grommet does triple duty as a handcrafted work of art, a functional cutting board, and a personal reminder of somewhere you love. The creators, Bill Mowart and Amy Stringer-Mowart, made their first U.S. state-shaped cutting boards for their own wedding reception. They carved them in the shape of Michigan, where she grew up, and Connecticut, his home state. Family and friends loved them, and today the design duo is busy making cutting boards for all 50 U.S. states and 4 countries.